The Prime Minister, Peter O’Neill has welcomed ongoing partnership activities between Papua New Guinea and Australia that are building capacity in healthcare, and providing ongoing support for the hosting of APEC in 2018. Following a courtesy call by H.E. 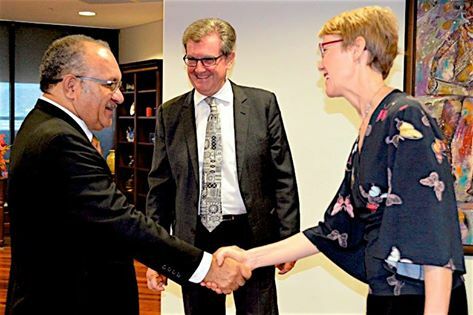 Bruce Davis, Australia’s High Commissioner to Papua New Guinea on Friday, PM O’Neill said the bilateral relationship with Australia continues to strengthen. “The ongoing co-operation between our two Governments is very strong which is also enhancing business links, and delivering capacity building support,” PM O’Neill said. “Australia’s commitment to improving healthcare in Papua New Guinea is delivering tangible results, particularly in dealing with diseases such as HIV/AIDs and tuberculosis. “Co-operation activities are underway, together with World Bank support, to deal with TB in areas that include Western Province, Gulf Province and Port Moresby, and this is saving lives. “We thank Australia for this ongoing healthcare co-operation that is also strengthening infrastructure and service delivery. “Current projects include the new nursing school, dental clinic and maternal and child health ward at Angau Hospital." PM O’Neill said Australian support and co-operation is particularly important as Papua New Guinea prepares to host APEC. “In 2018 the leaders of APEC’s 20 other Member Economies, together with more than 15 thousand delegates, will come to Papua New Guinea. “This is an enormous logistical undertaking, and Australia is providing support that is building our capacity, particularly in the area of safety and security. “I have expressed my appreciation to High Commissioner Davis for the support that Australia is providing, including the allocation of Australian Federal Police in a training and mentoring capacity. During the courtesy call the Prime Minister and High Commissioner further discussed the closure of the Manus Regional Processing Centre, that is underway as planned, and the outcome and processes of the 2017 National Election. The Prime Minister advised that a review of the election is due to begin, from which lessons learnt will be considered. As part of this review the Papua New Guinea Electoral Commission will seek perspectives and advice from its counterpart, the Australia Electoral Commission.